Amigos, I am my sad to report that we are definitely suffering from post holiday “yuckies” – also knows as UGHs (in capital letters) – here at la Casa Chanel. And it eeeeez a very serious epidemic! Mama has it. Dad has it. Even el Cato is dragging his nasty mop of a tail around here. As for me, I’ve been valiantly fighting it, but sigh … how much can a Chica bear?!?! The Chicos are gone away back to college. Mama is back to icky “works” full time so no more extra lap time for me. All the special holiday meals (and the bonus crumbs on the kitchen floor that accompanied those) are over with. Now the humans are trying to recover from the excesses and have reduced their dinners to SOUP! Que es eso? That is not even real food!!! Oh, and, wait for it … MY beautiful sparkly tree in the living room, also had to go!! I’ll admit it WAS looking a little worn out and brown, but it was mine! All mine!!! There is a definite cloud of gloom around here. But never you worry. I heard the bat-eared signal!! You know la Super Chica is on the case! She can leap from ottomans to couches, out run at least the pesky cato, and use her super telepathic powers of persuasion to conquer the strongest human mind! You know la Super Chica is the heroine in her tale (no tail jokes, please), ever ready to spring into action to save the frijoles! 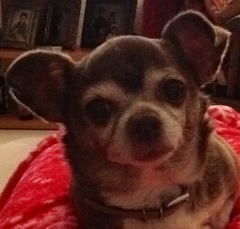 So my super strategic plan is a full force, Chihuahua love-packed intervention. We must immediately jump into “empty nest” bootcamp retraining for the Mama so she won’t be so sad. I miss the chicos too, you know. Still, she has me and I should be more than capable of capturing her whole attention and keeping her quite busy. A little indoctrination in the ways of the Chihuahua is in order. Wouldn’t you say ;)? You are currently viewing the archives for January, 2012 at Chihuahua Wisdom Blog.